♦ Easy to operate remotely via APP. Order shipping way: By air or Express. since the year of 2007 with rich experience. 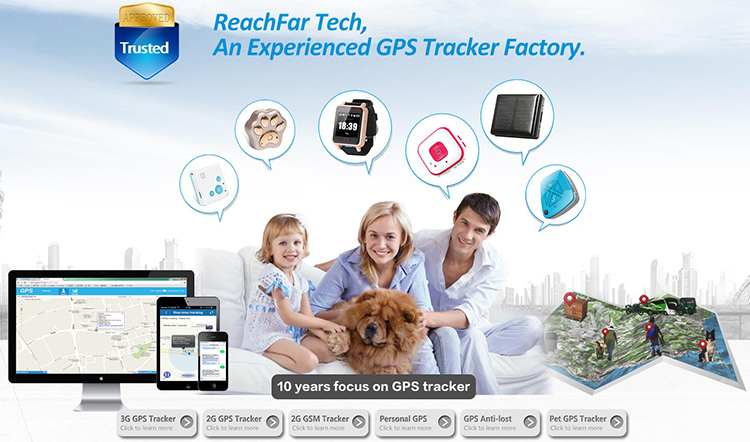 pet trackers, vehicle gps trackers, cow gps trackers, door alarm with gsm tracker, etc. Besides, we also provide clients with OEM service. For all device models, we have both branded and unbranded version. Clients can choose to print their own logo and package or even APP platform. Q: 1. How can I track the device? A: Insert a local Micro sim card and download our APP "Reachfar", login with device ID No. and default pass word: 123456. Or Login from website: www.gps123.org with same ID No. and pass word above. Or send SMS "dw#" to the device, the device will reply location map link sms to your smartphone. Q: 2. Is your APP and platform free to use? A: Yes, all the platform are free to use. Q: 3. How does the camera take photos when user falls down? A: When the device user falls down, the device will alarm and take photos automatically 15 sec later and uploads photos to APP. Besides, you can also take photos with the device camera via APP actively. Q: 4. Can I talk to the device user if any emergency? A: Yes, the device has function of 2-way communication. User can talk to SOS No with the device in an emergency by pressing one button. ♦ 2-year quality warranty and free after-sale service. 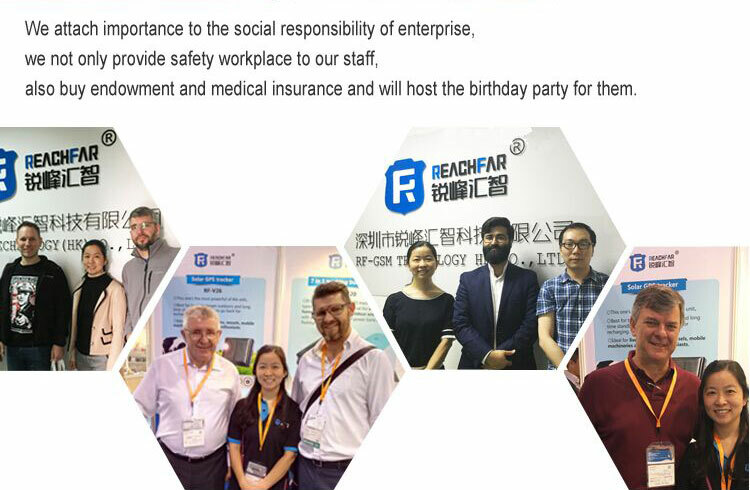 Shenzhen ReachFar Technology Company Limited is an high-tech enterprise which committed to professional- research & manufacturing & real-time tracker sales personal emergency alarm communicator. Now, we cover five categories, more than fifteen types of products, personal emergency alarm, vehicle alarm, home burglar alarm, pet anti-lost, cattle anti-lost. 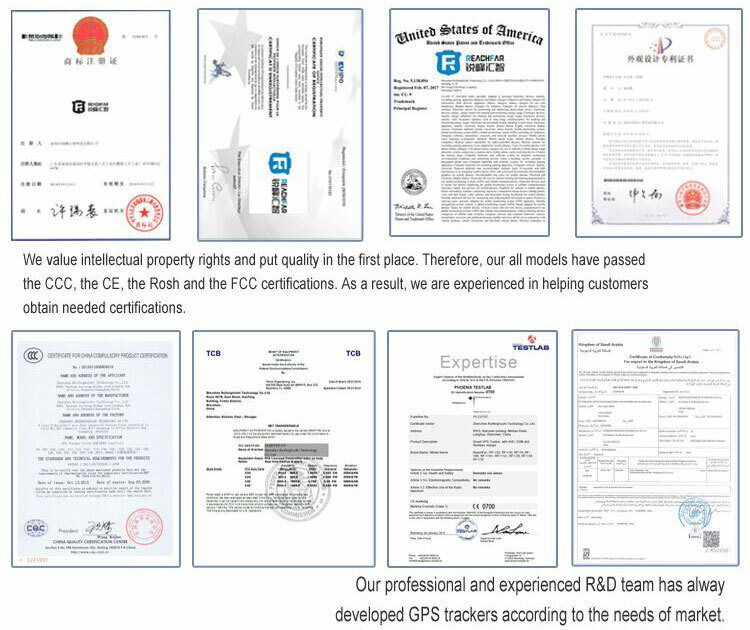 Focusing on products that are truly superior and innovative, RF-GSM has been awarded ISO9001 Quality Certification, our products have passed the international certification Design Patent, CE, FCC, RoHS, CCC, etc and grown to become one of the largest manufacturers and exporters of GPS tracking products in China. 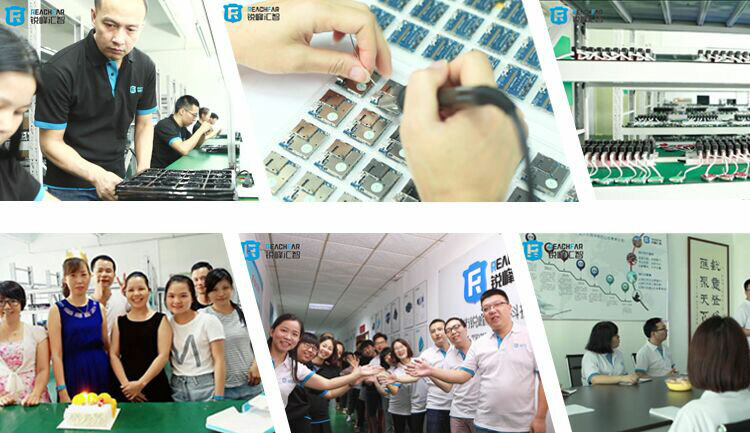 With one automatic production line, three assembly production lines, one packaging assembly line and two advanced testing lines, our daily output for GPS digital terminals reaches up to 2000 pieces. Support a variety of modes of transport, different countries have different payment methods. Q: How can I track the device? Insert a local Micro sim card (except RF-V36 with Nano sim card) and download our APP "Anytracking" or "Reachfar", login with device ID No. and default password: 123456. Login from website: www.gps123.org with same ID No. and password above. Send SMS "dw#" or "url#" to the device, the device will reply location map link sms to your smartphone. Q: Are your APP and platform free to use? A: Yes, both of them are free to use for lifetime. 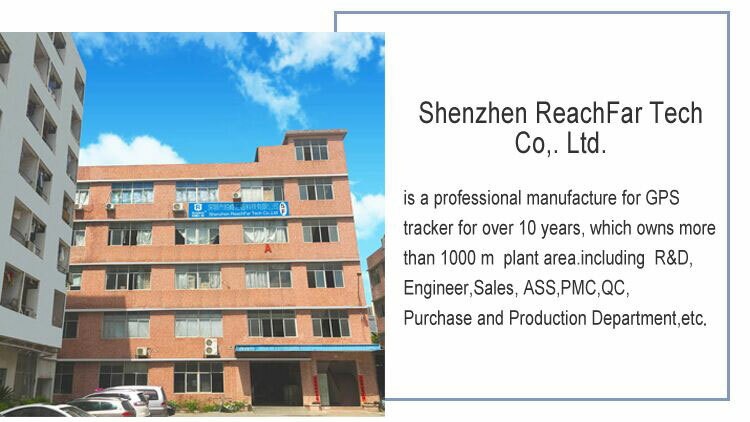 Q: As you are the direct manufacturer, can I order one or two samples from you? A: Yes, we also support sample orders. Q: Do you offer OEM service, like make us a new APP with our logo? A: Yes, we support OEM service, including making your APP, printing your logo on device and customizing boxes, manual with your language, etc. Q: Can I put order with PayPal for a fast shipment? A: Sure, we support both alibaba online orders and Paypal, T/T, Western Union offline orders. Please contact us for details. Q: How long will the delivery take after payment done? A: Delivery time depends on the shipping way you choose. We offer cheap but slow way with Singapore Registered Post and fast express ways like DHL,TNT,FedEx,UPS, etc. Post way takes about 7-20 days and Express way takes about 3-7 days to receive.